Shoulder pain at night is a very common problem. If you have shoulder pain at night pain you know how disruptive it can be! Night pain in your shoulder is almost always because of an issue with your rotator cuff. The most common cause of night pain in your shoulder is due to a process we call rotator cuff tendinosis. Other issues that can affect the rotator cuff and cause night pain include calcific tendonitis, rotator cuff tears, and rotator cuff tendonitis. Not being able to sleep can significantly affect your quality of life. We are going to explore the common causes of shoulder pain that can affect your ability to sleep, and some of the ways to treat it. Inflammation of the rotator cuff or bursitis (see picture below) above the rotator cuff are the most common reasons why you can not lay down and sleep through the night. The subacromial bursa is a small sack that sits on top of the rotator cuff tendons. 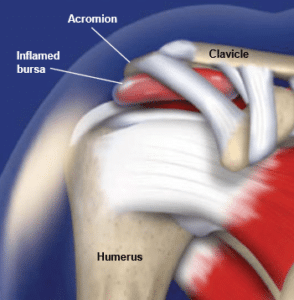 The bursa can become inflamed because of various rotator cuff issues. In addition, recent sports injuries or overuse injuries to the rotator cuff will also cause significant pain at night. No matter which side you try to sleep on, your shoulder pain wakes you up. Eventually, this will start to significantly affect your quality of life and your psychological well-being. The most common cause of shoulder pain when sleeping is the rotator cuff. Many of you will have only mild shoulder pain during the day, but terrible shoulder pain at night. When the rotator cuff is torn or frayed it will irritate a bursa. The bursa is a small pocket that sits on top of the rotator cuff. The bursa can become inflamed causing bursitis. That inflammation is the reason you have such severe pain at night. Not everyone with rotator cuff pain at night has a torn rotator cuff. There are many different reasons why your rotator cuff is causing you to wake up at night. Labral tears do not cause night pain. As you can see there are many different types of rotator cuff issues. The most common cause of rotator cuff pain is a process we call rotator cuff tendinosis. This implies that your rotator cuff is starting to wear out, fray and degenerate. If the rotator cuff begins to degenerate enough it may start to tear. A small tear can be referred to as a partial rotator cuff tear. The rougher surface due to a partial tear can irritate or inflame the bursa sitting on top of the rotator cuff. Your shoulder might hurt with certain activities too… but it is the night pain that usually makes you call our office. Some of you have injured yourself or fallen onto your arm and now your shoulder pain is keeping you up at night. For those of you with night pain following an injury, a more severe full thickness rotator cuff tear is possible. Sleeping in a reclining chair. Sleeping in the semi-sitting position can help many people with severe shoulder pain get to sleep. You can also prop yourself up on a couch or in bed with many pillows to get yourself elevated at least 45 degrees. An ice compression wrap: These ice sleeves seem to be very useful at minimizing your pain at night and allowing you to fall asleep. Many patients have commented over the years that these sleeve have been useful. Heating pads might be useful as well. Some people prefer ice, some prefer heat. There is little chance of harm, so try both until you find what works best for you. These ice compression sleeves are also useful and improve your pain following a rotator cuff overuse injury. Injections into the subacromial bursa, that area above your rotator cuff that tends to become inflamed can be very useful in some circumstances. We know that routine cortisone injections are not the best idea. Frequent injections near tendons can cause the tendons to degenerate further. Injections of cortisone into the bursa, however, can be very useful in people who are very unhappy because they can not sleep. These injections often start working in one day, and continue to work for a few weeks to months so you are able to start recovering from your loss of sleep. Again, I have had a few patients who brought these in to show me when they found their own way to get to sleep. These patients found that sleeping with a Shoulder Support Pillow/System enabled them to get to sleep. There is no research to support its use, but if you can’t sleep at night, many people will try everything. Physical therapy to address the rotator cuff is very useful over the long term to help improve your shoulder pain. For patients without severe night pain, then we start with physical therapy and try to avoid injections. If the pain at night is severe, then we usually try an injection first to calm things down, and follow that soon afterwards with a course of physical therapy. That therapy is generally taken 2-3 times per week for 4-6 weeks. Many of you are able to learn the exercises yourself so you can continue the exercises on your own. Continuing the exercises, even after the physical therapy is done is important to decrease the risk of the pain coming back. Many patients with severe shoulder pain at night require medications to help get them to sleep. At least until the pain starts to improve. Most people will starts with NSAIDs like Ibuprofen, Naproxen and Naprosyn which are available over the counter. Those of you with heart disease, ulcers, kidney disease, asthma and hypertension will want to speak with your doctor or cardiologist first. Combining an NSAID with tylenol can be even more useful. The two medications together can be very effective at minimizing your pain. Surgery has been proven to be effective at helping alleviate the night pain associated with many rotator cuff disorders. Surgery should be the last choice. If you do not respond to medications, injections, physical therapy and changing your sleeping positions then surgery might be appropriate to consider. Surgery for night pain in the shoulder is arthroscopic. That means that the surgery is performed through small holes with a fiberoptic camera. During the surgery we remove the inflammation in that bursa on top of your rotator cuff. If the rotator cuff has damage such as a partial tears, then we often place a novel biological patch which can help to regenerate a worn our rotator cuff. tThat patch is placed after the inflammation is removed, and the rotator cuff is smoothed out to remove the degenerative / frayed tendon which might be irritating your shoulder. This post describes this biological patch in more detail. Non-surgical treatment of rotator cuff related pain is very often effective. Most patients will be able to sleep comfortably after an injection and a course of physical therapy. A small percentage of people will not respond to non-surgical treatment. I find that people with severe night pain are usually ready to have surgery sooner. They are miserable …as are those who live with them. 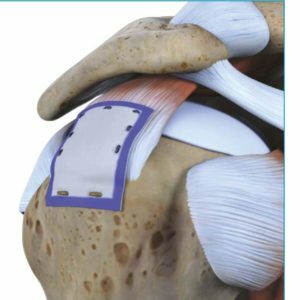 Because of the regenerative patch, we now have a surgical option proven to diminish or eliminate night pain in your shoulder. Research has shown that surgery on your rotator cuff to repair a rotator cuff tear or to reverse tendinosis can dramatically improve or eliminate your night pain. Surgical options for patients with night pain and injuries to the rotator cuff depend on the type of damage you have. The possible types of injuries we are dealing with include rotator cuff tendinosis, bursitis, a partial rotator cuff tear or a full thickness rotator cuff tear. For those of you who injured your rotator cuff from a fall and have weakness as well as night pain then a repair of your rotator cuff is possibly likely to be your best option. For patients with severe night pain due to tendinosis or a partial rotator cuff tear, one of the most promising procedures is where we can place a small patch into the shoulder during a shoulder arthroscopy (minimally invasive). Using a camera and other instruments we place the patch over the area of degeneration or tearing. Then biology should take over and slowly regenerate your rotator cuff over time. 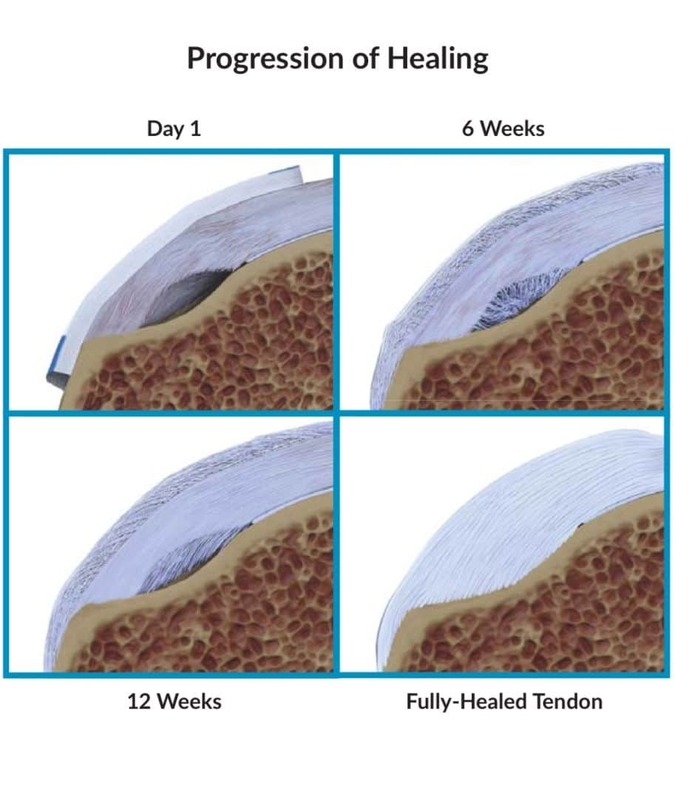 The patch usually becomes absorbed into your tendon and “induces” the tendon to heal. Before we place the patch, we will also clear away any inflamed bursa. 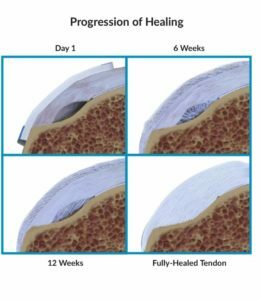 Removing the inflamed bursa will ease your discomfort. 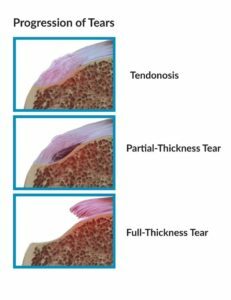 Reversing or healing the tendinosis and partial tear could give you a good chance of not having to deal with this again in the future. Only a few shoulder surgeons are currently utilizing this technology… but that is changing rapidly. Hi, Thankyou for the informative site! It’s great!r Not getting to sleep is right! The pain/dull constant ache always seems worse at night! My left arm has a stabbing feeling on top of shoulder, with ache down the front, and side. It feels weak. It was diagnosed by ultrasound and X-ray with tendonitis, bursitis and spur, yet ROM is pretty good! (Cortisone did nothing to help, and I sit up most nights as it hurts to lie in bed, though doesn’t usually wake me once I get to sleep! I have been told it needs an op. However, not until my first right arm improves..I’m actually 10 months post op for rotator cuff surgery (due to a car accident) for full thickness tear, bicep tenodesis, subacromial decompression and AC joint excision, CA ligament removed, bursar removed, etc. and have had severe inflammation ever since. A cortisone injection a month ago has made no difference. I can only raise my right arm forward to around shoulder height without pain/soreness..and sideways is not too great.. is this normal at this stage? I have a numb hand and elbow pain on inner and outer elbow, which has only been since the op..but was told it is probably not related to the surgery.For now I am told to give it time..around 18 months to heal..is this as good as it gets or how long until you know if the surgery actually failed? Many thanks! 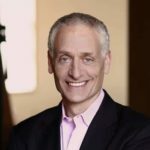 Excellent Post very informative Dr. Luks. Having a torn rotator cuff brings some serious pain to the shoulder and surrounding areas. Physical therapy and anti-inflammatory pills can really help even temporarily. However, what we have found with our patients who try our newly designed rapid release pro 2; also have seen significant reduction of pain in their shoulders. All while treating their pain naturally, without any pills or medications. Excellent Post .I experienced the same pain and so the post helpful me very much. It is very informative and explain the causes neatly and also mention the treatments its also good. Thanks for sharing this with us. That whole article was written as if you were in my head, explaining my exact case. I prop pillows under both of my shoulders at night, after wrapping a blanket around them. The only comfort I have found besides doing this is sleeping with both arms above my head. The lack of sleep has been detrimental to my way of life and I have found myself feeling overwhelmed with every normal day activities simply because I do not have the energy to do them. I am sleepy throughout most of my days and I need a resolution, ASAP! I had my rotator cuff checked years ago and was told that I had hyperlaxity. Well, many years later I still have pain and it only seems to be getting worse. I LOVE that I found your page and that someone else knows how I feel. I am a Tricare Prime customer and am hoping that changing to a different Primary Care Physician will help resolve my issues! Thank you for this information. I had surgery in October of 2015 Arthroscopic Subacromial Decompression / Distal Clavicle Resection. And a bicep moved. I have popping when push my self up away from a table or when get up out of the recliner. I have a great amount of pain and discomfort during the day and especially at night. I have had Cortizone shots and I sleep in different positions. Nothing is help me. I’m just wondering if my Doctor is not see that I may a Rotator Cuff Tendinosis? I’m a Electrician and I always have tools above my head. What would you recommend that I do or say to my currant doctor? The pain I wake up with at 5 AM is like a knife being twisted in both of my deltoids between the mussels. Very Very sore this morning. Shoulder pain at night really can be awful…. Have a shoulder doc check out your shoulder. Various non-surgical treatments can work well at alleviating night pain. If possible and if you have time to respond to me than that would be greatly appreciated. A few months ago I was trying to prevent a neighbor from falling down because of dizziness and in doing so I didn’t have proper leverage and I hurt my right shoulder as he was falling and my attempt of trying to keep him upright. I had an MRI done and I would like to share it with you to see if you have any recommendations as far as physical therapy that may allow me to heal the tears if that is possible, rather then go through surgery which will take me out of work and be in a sling for at least 4 months.. I also have a very low tolerance for pain..Thank you for your interest in helping people, that is very commendable. The following is the MRI results.. Right shoulder pain with history of a lifting injury. Evaluate for rotator cuff tearing. Rotator Cuff: A small full-thickness tear of the supraspinatus tendon is seen at its greater tuberosity insertion posteriorly, measuring approximately 9 x 6 mm (series 105 image 10, series 109 image 1 5, series 104 image 5). Mild diffuse thinning of the supraspinatus tendon is seen in its distal 2 cm. The infraspinatus tendon shows mild tendinosis. There is also intermediate signal along the undersurface of the distal infraspinatus tendon, which could reflect mild undersurface tendon fraying. The teres minor and subsapularis tendons appear intact. The regional muscles show normal signal intensity and volume. The Long-head of the biceps tendon shows a mild degree of tenosynovitis. A small amount of fluid is present in the subacromial/subdeltoid bursa. Acromion/AC Joint: The anterior acromion shows a type of 1 flat undersurface. There is no lateral or anterior downsloping of the acromion, lateral subacromial enthesophyte formation, or osacromial. The acromiohumeral distance is narrowed to approximately 5 mm. There is a mild degree of osteoarthritic change at the acromioclavicular joint, without evidence of mass effect on the rotator cuff. Mild marrow edema and cystic change are seen in the distal clavicle adjacent to the acromioclavicular joint. 1. A 9 x mm focal full-thickness tear of the distal posterior supraspinatus tendon fibers is seen in the right shoulder. 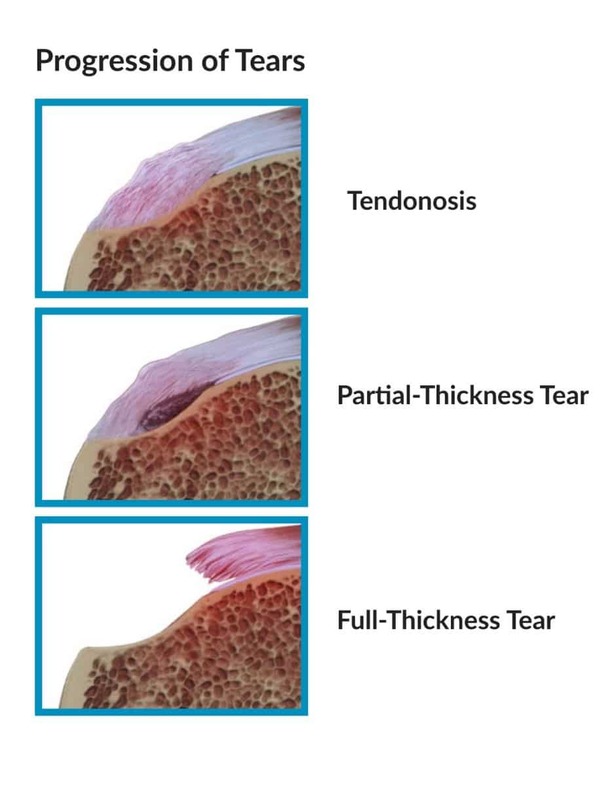 There is diffuse attemuation of the distal 2 cm of the supraspinatus tendon, which may reflect more diffuse partial thickness tendon tearing or attritional/atrophic type change in the tendon. 2. Mild tendinosis of the infraspinatus with questionable mild undersurface tendon fraying distally. 4. Small amount of fluid in the subacromial/subdeltoid bursa. 5. Mild osteoarthritic change at the acromioclavicular joint. Many of these small rotator cuff tears are degenerative in nature. As your report says… the “diffuse attenuation” is likely due to time related degeneration. In all likelihood these findings were there before the incident in question. There is no “edema”, etc to lead one to believe that the tear is acute. Depending on your age, nearly 25-50% of people are walking around with these tears and do not know it. Why some hurt and others do not we can not answer. Most of these shoulders are treated with PT to see if the pain subsides and your function improves. Some of these tears might become larger over time (usually many years) while some tears do not become larger over time. We can not predict which tears might become larger. Therefore we monitor people who have been treated non-operatively with small tears like this.